Initially I smirked at what was happening. The foolish arrogance of a man too confident in his own daddiness had done me a disservice. My youngest daughter had begun to cry while we were wandering through the produce section of a local grocery. I wasn’t sure what she was crying about, but I was pretty sure I could calm her down. I picked her up out of the basket, and held her with the confidence of a father who was certain his fatherliness would calm his little girl. For a moment, it seemed to work. She didn’t stop crying completely, but her commitment to making a scene appeared to lose its legs. In retrospect, I pulled a George W. in a flight suit and a ‘Mission Accomplished’ banner waving in the background; I claimed victory before it all got started. The first sign this wasn’t going to end well was when I tried to place my youngest daughter back into the grocery cart. I couldn’t sit her still enough to buckle her in, and every time I went for the strap, she was halfway out of the cart trying to climb back into my arms. While I was trying to prevent her from doing a nose dive onto the grocery’s floor she increased the volume and intensity of her crying. What was a simple cry, that could be ignored with a bit of concentration, quickly ratcheted up to a full on shriek. She was twisting in my arms and killing my ears as she tried to point out the source of her frustration. It was one of those car grocery carts that her brothers were riding in with their mother. The one she was pointing to was unattended, but it had a bottle of water and a sales paper in it. I couldn’t determine whether or not someone was using it, or if it had been abandoned. My daughter’s shrieks had taken on a maniacal quality that triggered a fight or flight instinct. I fled, but the problem, was that I fled with my daughter in my arms. 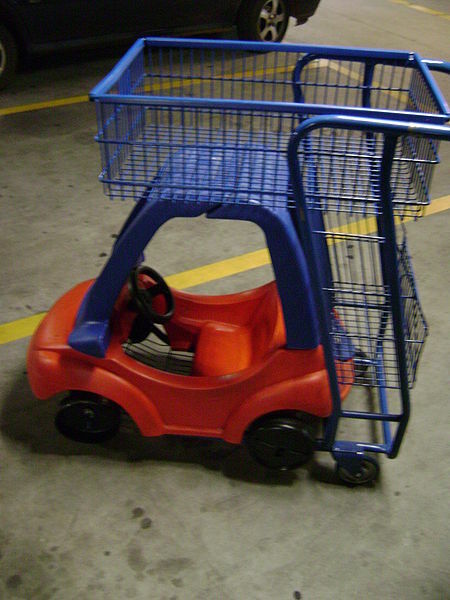 I called myself looking for another ‘car’ cart while I pushed a cart, held a screaming two year old, and scoped the place for an empty ‘car’ cart. I circled the entire store looking and endured judgement from other adults before I found my wife. I gave her the groceries that were in my basket, my wallet, and announced we were going to the minivan. In the minivan she wailed even harder. My attempts to block her out by thumbing through screens on my phone, was met with paranoid thoughts that some do-gooder pedestrian, would call Child Protective Services on a suspicious man in a minivan. I was expecting my daughter to get tired, give up, or tap out, but her commitment to the struggle was real; and had I spotted one of those car carts in the parking lot, I would have retrieved it, sat her in it, and walked for miles. But there was no cart to be found, only the incredibly shrill sound of my youngest daughter’s discontent, and it’s moments like those, where you want to strangle every person that told you that children are a ‘blessing’.